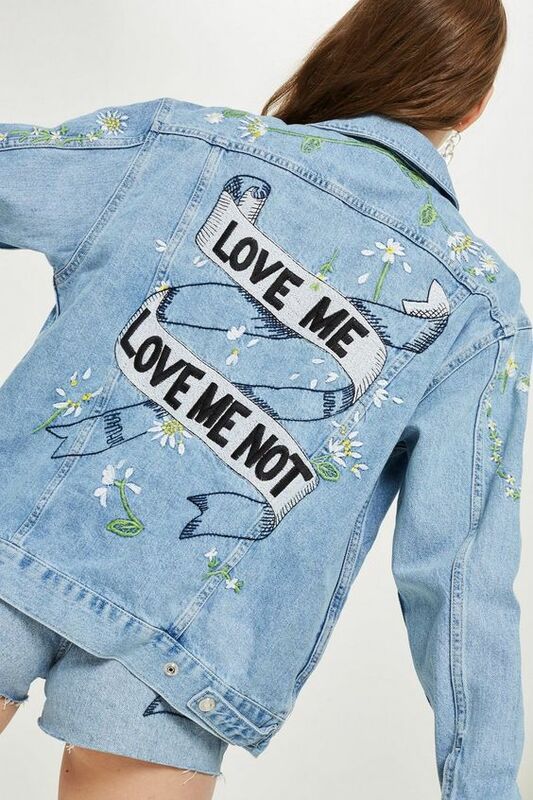 If there’s one staple in my closet, it’s a denim jacket. 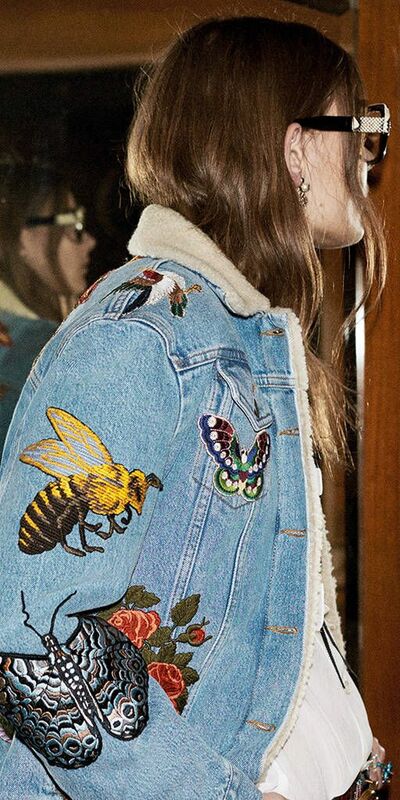 Throw one on to dress up your casual clothes or dress down a party dress. They keep the breeze off a sundress at a late summer wedding, and keep the heat in over a cozy winter sweater. Unlike a blazer, you can actually move in it — not to mention how much easier they are to clean. The more worn they become, the more charm they carry. 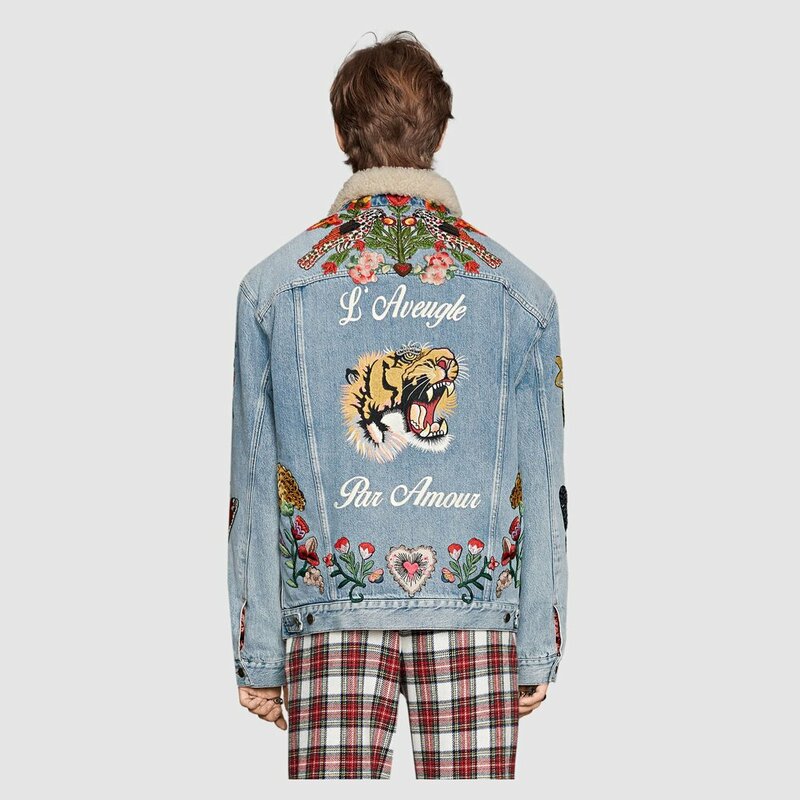 Vintage denim has become especially popular in the re-awakening of 90’s grunge in the last few years. My Grandfather is a rancher. He’s been wearing fleece-collared Levi jackets his entire life. He’s got a closet full of them, hung in order of wear, with holes and stains and shiny brown snaps. I was working backstage at New York Fashion Week shortly after I’d first moved to the city, and my jaw about hit the floor when a model came flashing by with a trail of reporters in one of Grandpa’s jackets. That’s what you threw on when you went to feed the chickens… I was shocked to see it over her floor-length sequin gown and Dr Martens. I guessed Grandpa had about seven in his closet at that moment. I wondered if he knew he was the original hipster. So. 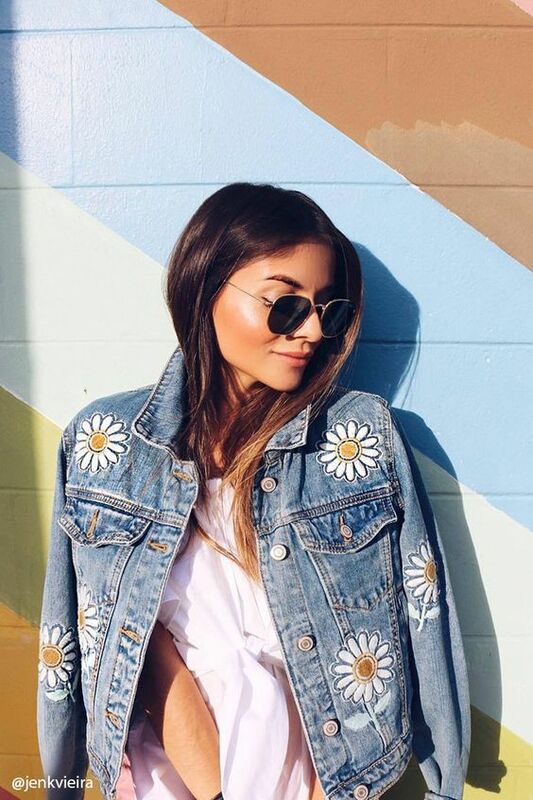 Denim Jackets are fun and there are pretty much no rules when it comes to styling them. Fun. No rules. That combo is the greatest fashion statement of all time. Now how can we elevate that? More fun, more nonsense. 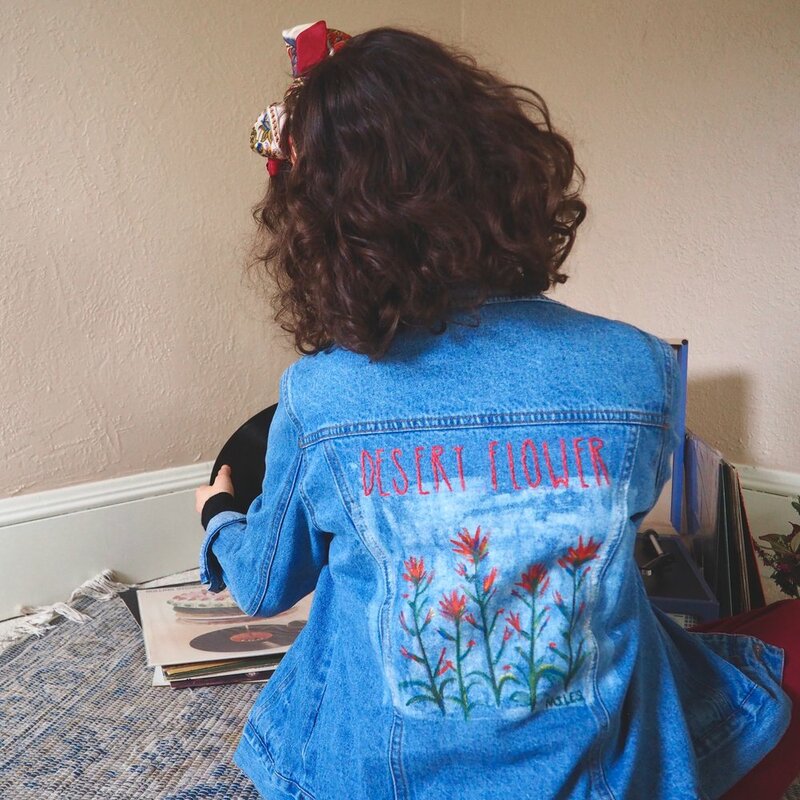 My friend Julia was given an old denim jacket a few months ago. It was the perfect weight, color, and size. It also had a creepy spaceman painted on the back. So she checked it into Kate Miles rehab for a little astronaut detox and a makeover. Julia and I grew up on the Oregon High Desert together and share a love of ice cream, Johnny Cash, and Indian Paintbrush. I started there, scooping Tillamook Udderly Chocolate, putting a Cash record on, and setting up my paints while the washing machine worked Spaceman over. Wildwood Flower is one of my favorite underrated Cash songs. 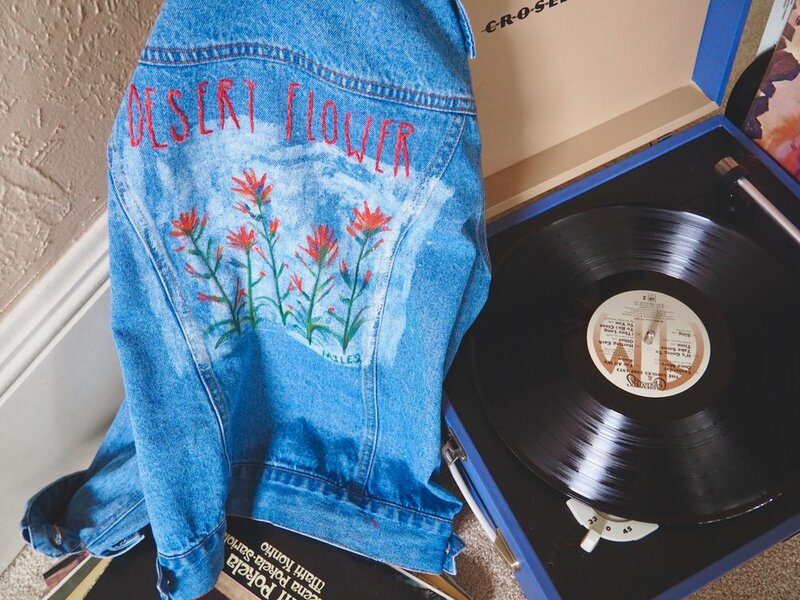 I decided to paint some of our favorite flowers and embroider the words “Desert Flower” at the top. 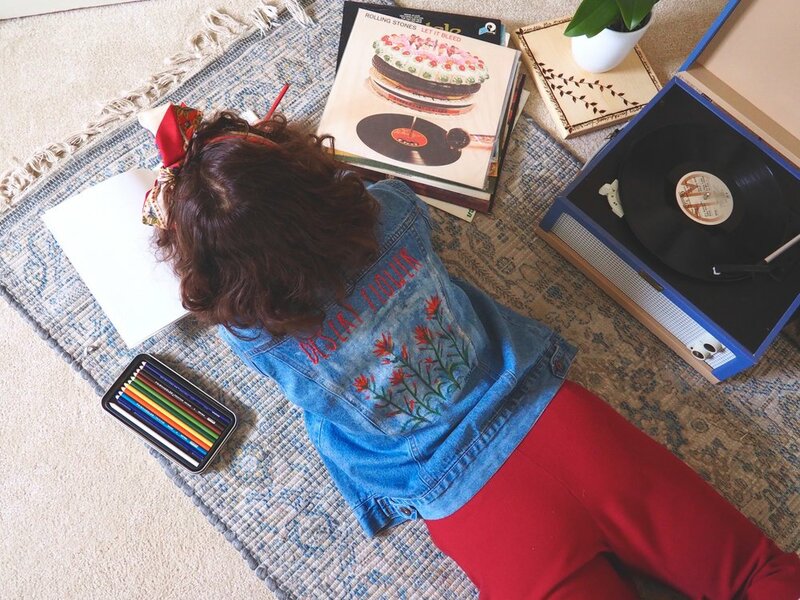 Here’s a little tutorial on how to personalize your vintage denim jacket. Like it? 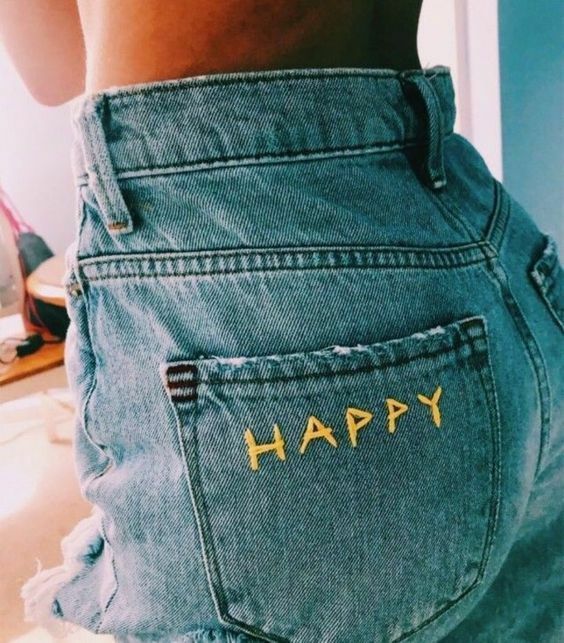 Try it on jeans too! A medium straight edged paintbrush and a fine detail brush. I have found regular acrylic paint to work beautifully on most any fabric from silk chiffon to denim. The results aren’t as delicate as they would be if you were painting on paper, but The colors are beautiful and hold up just fine in hand washing. I found this video really helpful on how to paint Indian Paintbrush. Wash and prepare the denim. 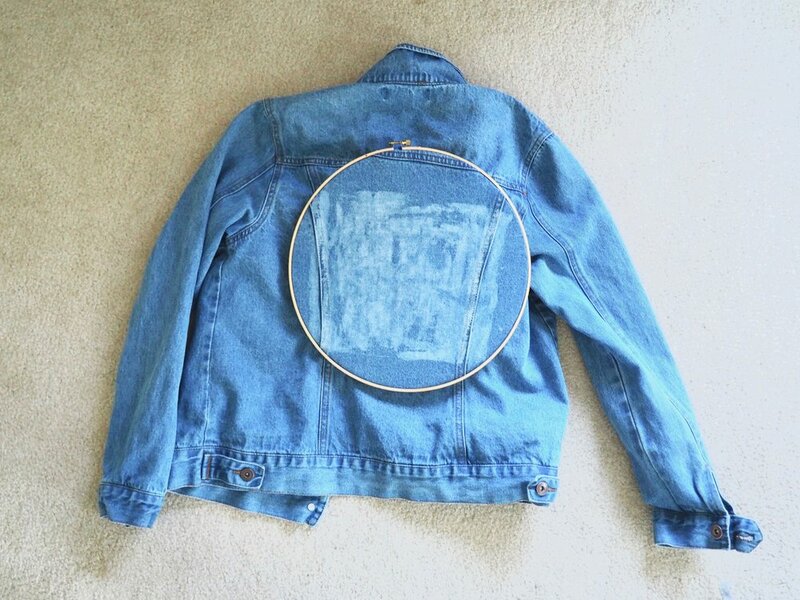 Stretch and embroidery hoop around the area you want to embellish to avoid creating bubbles. Use chalk or a colored pencil to give a simple outline of what you want to paint or embroider. 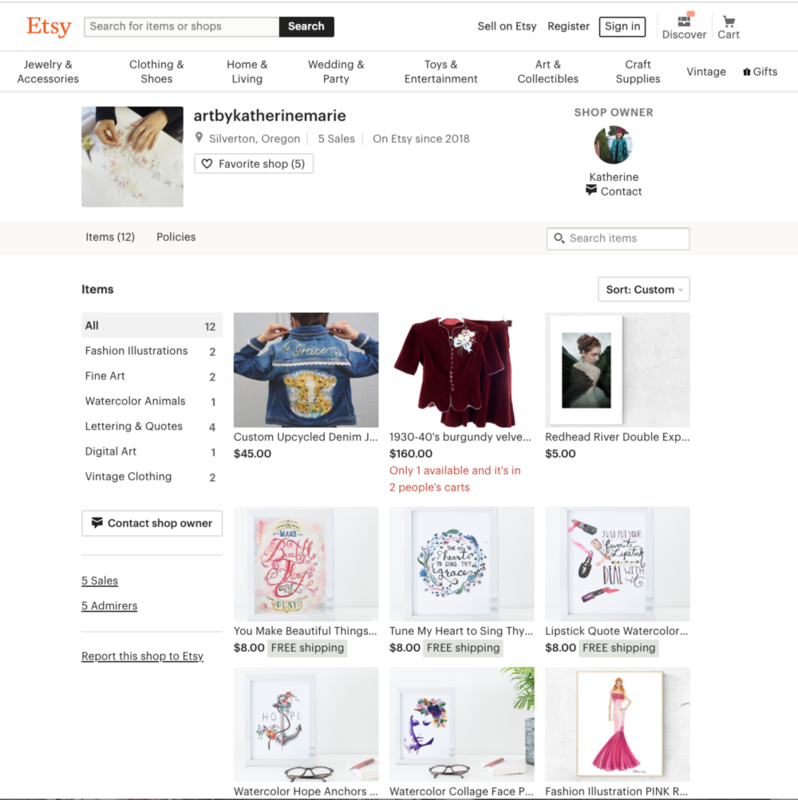 After the paint is completely dry, prepare your embroidery materials. I like to use a split stick for words, because it’s really good for curved lines and is very easy to do. Thread your needle and tie a knot in one end of your threads. I used 3 strands of red and 3 strands of orange together for a bulkier 2-color design. Come up through the wrong-side of the fabric and go back down about 1/4 inch or less in front of where you came up. Come back up halfway through the middle of the last stitch and go back down again as in step two, about 1/4 inch or less in front of where you came up. Continue this process until you get the desired line or letter and move to the next. Check out this previous post featuring my handmade red wool crepe trousers styled another way!